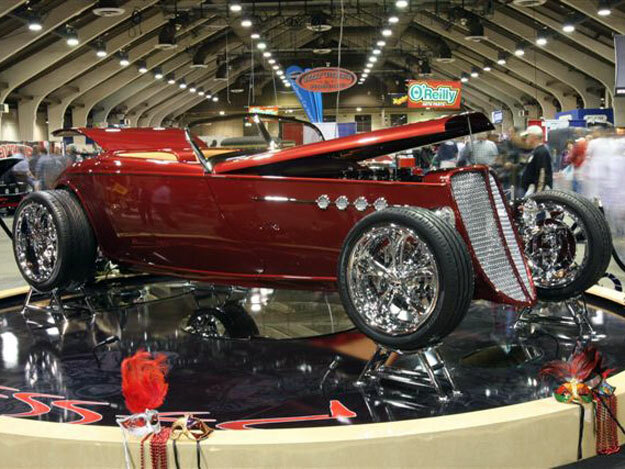 The 48th Annual O’Reilly Auto Parts World of Wheels proudly welcomes the 2010 America's Most Beautiful Roadster from the 61st Annual Grand National Roadster Show in Pomona, Calif. to the World of Wheels show at Donald E. Stephens Convention Center (5555 N. River Road, Rosemont, Ill.). The 1933 Ford Roadster, owned by Mike Dingman from Moorpark, Calif., will be competing for the Legend Cup award, among others. Tickets are still available for the 48th Annual O'Reilly Auto Parts World of Wheels, happening March 5-7, so don't miss your chance to get to the show. Regular admission can be purchased for $16 for adults, $5 for children ages 6-12, and children five and under are free. Discount tickets for the O’Reilly Auto Parts World of Wheels are available at Chicagoland O’Reilly Auto Parts retailers. Regular adult admission is $14 and children’s admission is $4 if purchased in advance at O’Reilly Auto Parts. To see where the nearest O’Reilly retailer is, please visit www.oreillyauto.com. Tweet Us and Win!Be sure to follow the O’Reilly Auto Parts World of Wheels show on Twitter for a chance to win a family 4-pack of tickets. One lucky follower will win! Tweet us at @WorldofWheelsIL. Interested in cars? Subscribe to the World of Wheels blog at www.worldofwheels.wordpress.com!